RUSH: Now, let’s get to Christopher Wylie. I want to tell you who this guy is. He is the, quote, unquote, whistleblower who ran to the New York Times with the story on Cambridge Analytica. He is a gay vegan Canadian with pink hair. A gay vegan Canadian. The New York Times in their report said that Christopher Wylie had ties to former Obama campaign staffers. 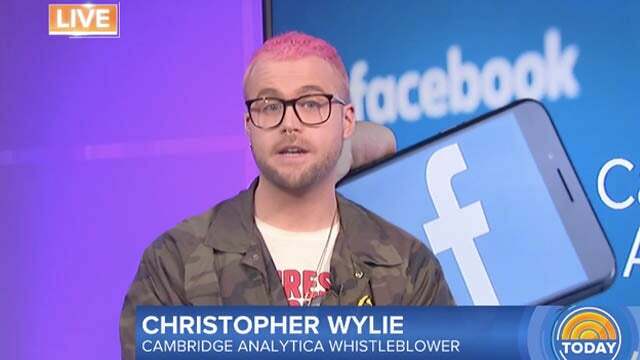 But this guy, Christopher Wylie and some other scientist, are the ones who supposedly misled Facebook by saying that they were just paying people to take their app’s personality test for academic research. WYLIE: Let me be clear. I left Cambridge Analytica, uh, before it joined with the Trump campaign. What I do know is that the company, uh, had been in talks with Trump before, uh, Trump had even announced, uh, his candidacy. But you’ll have to ask Cambridge Analytica directly if they were using, uh, this misappropriated data for Donald Trump. But what I do know is that this was the foundation of Cambridge Analytica. Cambridge Analytica was founded on misappropriated data of at least 50 million Facebook users. It’s really important for Americans to know what this company has been doing with their data, and it’s really important I think, uh, to find out, was this data used to help elect Donald Trump? RUSH: Now, this is the whistleblower. Now, the thing is that this data was not misappropriated. Cambridge Analytica obtained the data by doing exactly what other Facebook app developers did. They played by the Facebook rules of the moment. Facebook had rules about data harvesting, and they were in place. So these apps were created by people to access the data. Facebook was advertising this almost as a feature to app developers. Facebook has been seeking ways to monetize their massive user database in any number of ways. So if Cambridge Analytica had technology that was able to collect all of your data and data about your friends, it’s because Facebook made it available. This guy Wylie is lying through his teeth about this being misappropriated. Cambridge Analytica didn’t steal anything. But if they did, then what the hell was Obama doing three years earlier? That’s the great dichotomy and disconnect here. And it is classic, it’s typical of exactly what’s going on in Washington today. Take something that the Democrats are doing, and they’re getting praised to the hilt by the media for it, and then when the Republicans figure out how to also do it, they get criminalized for it. They become targets of criminal law enforcement, and they are charged and accused of engaging in criminal behavior. Cambridge Analytica doesn’t even come close to this massive database that Obama had put together with the assistance of Google and Zuckerberg. And I might add as a little aside here, as we sit here at this very moment, Facebook and Twitter are summarily dismissing conservative sites and businesses from their operations. Facebook and Twitter are targeting conservative businesses, websites, bloggers, whatever conservative organization is using Facebook to obtain an audience, Facebook is canning them. Facebook is suspending them. Facebook’s getting rid of them under the premise that they’re engaging in hate speech or offensive speech or what have you. WYLIE: What I do know is that Cambridge Analytica was meeting with Corey Lewandowski in 2015 before Trump had even announced and offering the services that I’m talking about right now. 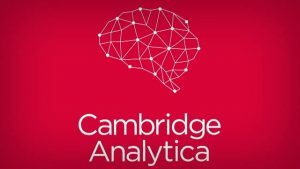 Cambridge Analytica was birthed out of a company called SEL Group, which is a military contractor based in London. This data was used to create profiling algorithms that would allow us to explore mental vulnerabilities of people and then map out ways to inject information into different streams or channels of content online so that people started to see things all over the place that may or may not have been true. This is a company that really took fake news to the next level by pairing it with algorithms. RUSH: Well, isn’t this just wonderful. So now Cambridge Analytica, the Mercers, were the originators of fake news. So apparently what they did, if we’re to believe this gay pink haired vegan Canadian, Cambridge Analytica, the Mercers were using Facebook data to find mentally disturbed people, other people upset, snowflakes, whatever, and then matching news that would scare the hell out of them and then linking that news to, say, Democrats or others. That’s the kind of thing he’s saying was going on. And he’s trying to set these Cambridge Analytica people up as the originators of this, and in truth the originators is Google. Google. Google, Google, Google before you even get to Facebook. This is Google’s way of operating, finding out everything about you they can and then finding ways to use it to separate you from your money. They sell advertising based on the data. Some people find it cool. Others find it intrusive. Let me give you an example. You live in Oshkosh, you take a trip to New York. You go to New York for five days, and whatever you do in New York, your phone records by way of location services. You go to restaurants, you go to museums, go take a couple tours, do an Uber, whatever. Google has all of that. If you’re using a Google product, if you’re using a Google website, if you’re using Google photos, any Google app will have everything you did in New York. Okay. So you go back to Oshkosh. The next time you go to New York, when you get off the plane, a history of your last trip to New York will show up right on your phone, where you went to eat, what’s changed, what the menus are, what prices are. Wherever you went, Google will have it for you as a reminder, as a suggestion. And when you get back to New York, people in New York who advertise things related what you did, you’ll start seeing those ads all throughout your usage of your phone or your tablet or what have you. If while you’re in New York you search using Google for whatever, that search result is forever filed and is always available for Google to furnish you with new results or new information from that search. You don’t have to remember everything because every bit of the data that Google collects on you is stored in their cloud, on their servers. And it’s the same with Facebook. It’s not kept on your phone and kept encrypted. It’s off-loaded and everything about — now, Google doesn’t know you from Adam. It’s not that there’s somebody from Google watching you, John Q. Smith, as you travel through New York. Everything is an algorithm and everything has a number, an ID number. It’s a little bit over the top to say Google’s spying on you, but the point is, if anybody else gets hold of the database or perhaps even people in Google, let’s say Obama’s in bed with Google and they want to know about people that live in Oshkosh because of the election coming up and how they voted in the past and what these people in Oshkosh are interested in and if they tend Republican, how could they make the Republicans look bad, all of that data gets thrown into this mix and regurgitated to you. And, as such, it’s not nearly as good or as comprehensive as Google’s is because Apple simply doesn’t store it on their servers, and they make a big marketing push about that. But Google and Facebook are taking everything they’ve got. And what Facebook did was advertise to people, the scholars, research organizations, political parties, they advertised their user database, and they created apps so that researchers could access their database of users, which is what Cambridge Analytica did. There’s nothing criminal here. I don’t care about this Wylie guy and what he’s saying and how it sounds. The very proof of the fact that when Obama does it, it’s praiseworthy — there’s nothing criminal about it. There aren’t any whistleblowers. Now that Trump did it and got elected… these people are gonna have to make up their mind, as I said. Either Trump is a bumbling, stumbling, incompetent, doesn’t know what he’s doing, bull-in-the-china-shop fool, or he’s not. He’s obviously a very, very brilliant manipulator of high-tech. Why, he was even able to steal an election using the Russians, and he’s so good at it, there isn’t any evidence of it, there aren’t any fingerprints! But we know what Cambridge Analytica did with Facebook. They weren’t able to hide it, but Trump has been able to hide everything he did. This all is so absurd. It’s beginning to be ridiculous even to talk about it. RUSH: I just found something that I’m gonna tell you about here. Google, they really don’t hide a lot of this. If you have a Google account, I don’t care if it’s in YouTube, if it is Google Now, if you have a Google account, Gmail, you can find what’s called your timeline. And it’s easy. It’s in the settings panel. And it is a listing and a map with dates and times of everywhere you’ve been as a Google member, ever since you’ve had a Google account. You can pick June 20th, 2013, to see where you were, and Google knows. You do too. You can look it up and find it. You can look at it on a map. You can look at it as a text list of places you’ve been. It will show you the route you take to get where you got. When you were at work, when you were at home, wherever you went. They know it all. And it’s all in their servers, in their cloud. Does anybody remember, by the way — I have a vague memory — Hillary? did she complain at some point that Obama was not sharing a lot of his database with her? I have this vague memory creeping through the deep, dark crevices of my cranial cavity. I’m just amazed at how the identical thing gets spun at criminal activity if Republicans do it.